Notification Groups define a group of individuals who will receive emails or SMS messages in the event of an Alert being triggered. You can specify multiple groups, have individuals in more than one group, and generally tailor Notification Groups to your specific needs to ensure that only the people who are appropriate to respond or be notified of an Alert event are contacted. You can either edit an existing group or create new groups for specific scenarios. 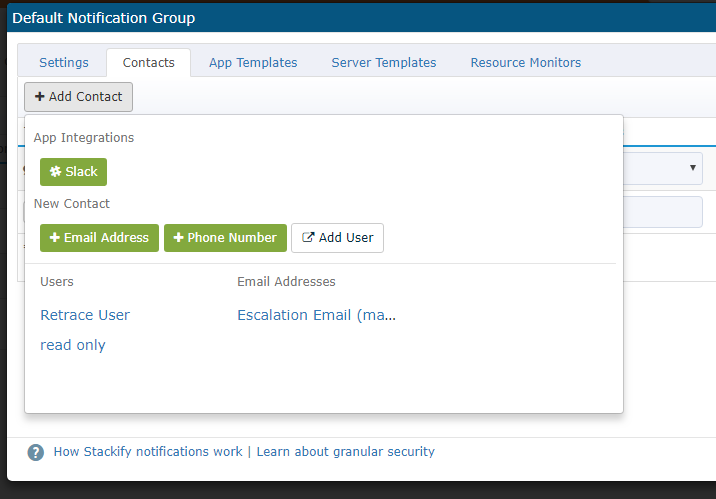 To add a new Notification Group, navigate to the Settings page and select the Alerts Tab. If you do not see the Notification Groups button or the Settings tab, you will need to contact your Account Admin to request permission to edit Notification Groups. 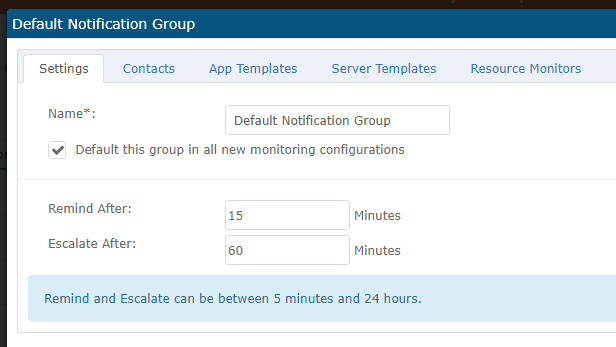 From the Settings tab you can edit the name of your Notification Group, choose if this is the default Notification Group to be applied anytime a new Server or App Monitoring Template is created, and also set the waiting period for Reminders and Escalations. Existing User: These are all users associated with your Retrace Account. Clicking the Add User button under New Contact will take you to the Settings>Users page. Slack Integration allows you to choose when to send notifications to your integrated Slack channel. Please review our documentation on how to configure Slack integration. After adding your contacts, you will need to configure when they receive notifications. Each type of contact will have different options for configuration. To remove a Contact from the Notification Group, click the red X icon to the far right. When modifying an existing Notification group in this window, you will be able to see which App, Template, or Resource that the particular notification group is applied to -all in one place. Here you can globally specify how you will receive notifications. To specify what Templates and Monitors the notification group will be applied to, go through each tab in the Modify Notification Window and select "Add New". The Warning column will show you any Notification Groups that are sending notifications to a User that does not have permission to view the app, server, or resource the alert came from. This means if the user receives the notification, they will not be able to take action on the alert in Retrace. To change permissions for a given user, see our Managing Users and Roles documentation.